We now have an extra Devon, a young bull calf bought from the Goldings Herd. thats him 2nd from the right. Plan to register him in the spring assuming he makes the grade. 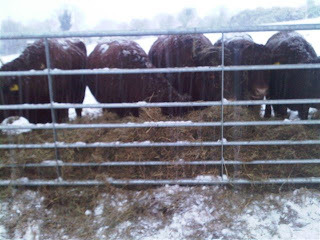 Excuse the picture, it was first thing, windy, snowing ..... tough cattle!